Sol y Canto - What's New? Sol y Canto is proud to announce the release of our latest CD/DVD project, SABOR Y MEMORIA: a Musical Feast in Seven Courses. Composed by musical director Brian Amador for the Sol y Canto Sextet plus a string quartet, SABOR Y MEMORIA is a seven-song suite all about food, in rhythms from Cuba, Venezuela, Mexico, Argentina, Peru, Panama and Puerto Rico. From appetizer to dessert, it's a Latino musico-culinary, multi-sensory mix of music, images and flavors, where each movement is a "dish" in an imaginary meal! Listening to Sabor y Memoria and seeing the spectacular food photos, you're bound to work up an appetite. So the least we could do is offer you some of Brian's recipes so you can make the experience even more multi-sensory. Enjoy! 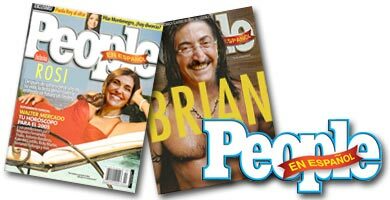 Rosi and Brian amador featured in People en Español magazine.